Engineered for ultimate oral health. Smartybrush is able to comprehensively clean tooth enamel (the hardest substance in the body), bone and gum tissue precisely while leaving surrounding areas unaffected. This helps conserve and maintain your natural teeth longer. From the moment you start using it, the Smartybrush has made a schedule for your oral healthcare that’s helping you keep an optimal oral health. Even for those who floss, brush and use fluoride regularly, sometimes you still end up with a cavity. Between work, school, and children, plus everything else, there is less time to visit your dentist. 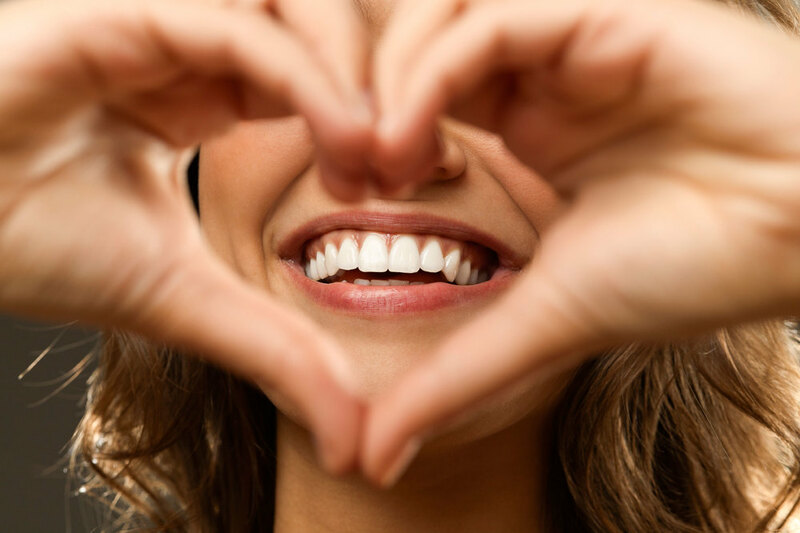 By providing the technology that provides detail analysis and feedback of your overall dentition it provides you the ability to perform certain cleaning procedures that were previously done by dental professionals, saving you time and hassle as you address the dental needs of you and your family. This translates into smarter more productive dental visits. Advanced technology, modern features all in Topple-Proof® design. 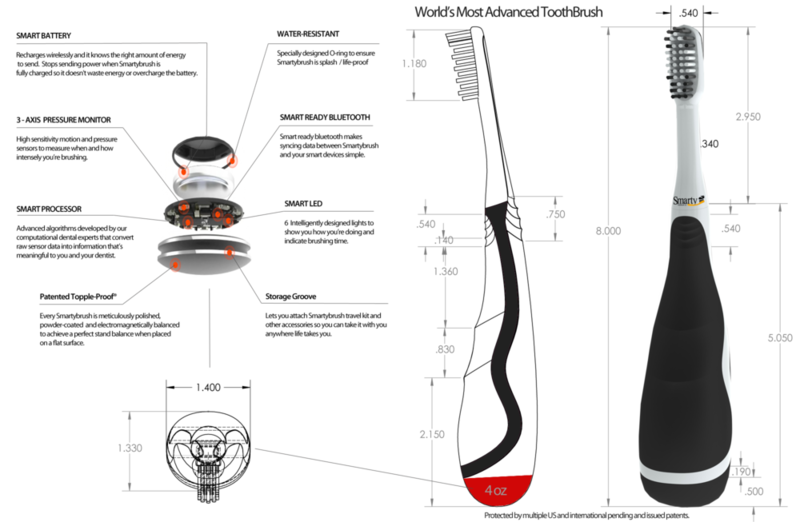 Smart toothbrush that changes the game. Finally. The Smart toothbrush makes it all happen. Once you start brushing you’ll get a second-by-second real-time read-out of your brushing habits. With the latest Bluetooth 4.0, the SmartyBrush also pairs with a host of other health-tracking devices, so you can be on top of your healthcare. The PerioAction® ultrasonic technology is specially developed for use with PerioApp®. The innovative smart brush allows you to clean in a pain-free way that is gentle on your teeth. When carrying out cleaning once the ultrasonic brush detects an areas in need of extra attention, it is indicated to you reliably as the light ring integrated into the SmartyBrush will change color and later recorded in the App. This supports your tactile perception perfectly while brushing – for precise and gentle results. The Smart brush analyzer measures brushing frequency, pressure, rate and quality in an All-in-one Oralbrush. PerioAction® ultrasonic technology creates dynamic cleaning powerfully effective, yet remarkably gentle, resulting in a superior clean that you can see and feel. Smartybrush offers exceptional whitening in addition to plaque removal, making it perfect for those who want to keep their smile its brightest. A healthy mouth is the foundation for a healthy life. PerioApp® is a great way to track and monitor your oral health and activities. Whether you are using an iPhone, iPad, iPod touch or Android, or using our web portal, you get great tools that make your overall oral health and activity come alive. Discover your brushing data put into perspective and step off the emotional roller coaster. Consider variations of the PerioApp® index to make sure you target the right area. Reach an unmatched level of accuracy. All our smart connected toothbrushes are equipped with PerioAction®, a technology utilizing multiple sensors embedded into the brush that constantly communicate with PerioApp®. To optimize brushing and its measurement, it constantly provides feedback via our intelligently designed software. Successful lifestyle changes rely on continued efforts. Having access to this rich Perio data helps you and your dental professionals see your progress and make informed choices. In the end, you spare your motivation, enjoy the brush tracking process and enter a virtuous circle. Smart and intuitive now for the whole family. The Smarty brush is made for the whole family: the PerioApp® is designed to recognize up to 8 users. Everyone can have their own user profile and access it independently. Share your results from the relaxed environment of your home - straight to your dental professionals. Just push a button on the PerioApp® to send an update and seek advice. As more and more consumers adopt new devices, applications and services to understand and improve their health, we are building the platform in the middle for all to visualize, share and optimize their oral health regardless of their particular tools, needs and goals. Tracks your brushing habits and just about everything else related to your dental health. The Smartybrush has an overall ergonomically designed handle to reduce and alleviate pressure from hard brushing. Our signature Topple-Proof® design ensures a 99% germ-free, free standing toothbrush with Sure-Grip® fit that creates an enjoyable brushing experience while ensuring the dentist recommended angle of the bristles to teeth form. It provides an easy adaptation going from your teeth and gums to your tongue. It is designed with multiple size bristles that help reduce chronic bleeding and receding gums while brushing your teeth along with ultra-soft pointed bristles that reach deep into crevices of your tongue to provide a clean, fresh, bacteria and odor free mouth. Multiple sensors embedded into the brush constantly communicate with PerioApp® to keep you updated on what's going on with your oral health and habit. The Smartybrush might seem high-tech at first, but it is friendly, intuitive and best of all very easy to use. The future is now! All works © Smartybrush 2014. Please do not reproduce without the expressed written consent of Smartybrush. 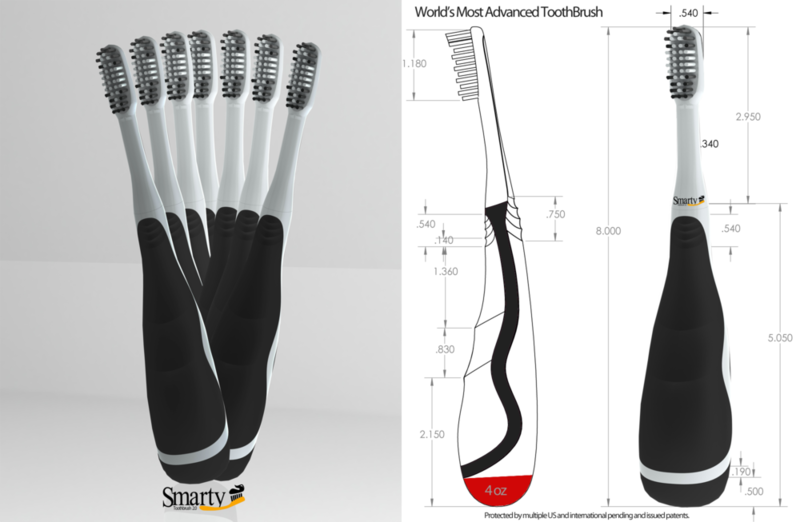 SmartyBrush is the proud developer of the world's fist true Smart connected toothbrush.